2020 Innovation - Access your 2 FREE CPD webinars here! you can unsubscribe at anytime via the unsubscribe link in the footer of 2020 emails that you may receive from us. Get your FREE 2019 MTD Update webinar here! with Rebecca Benneyworth MBE BSc FCA! 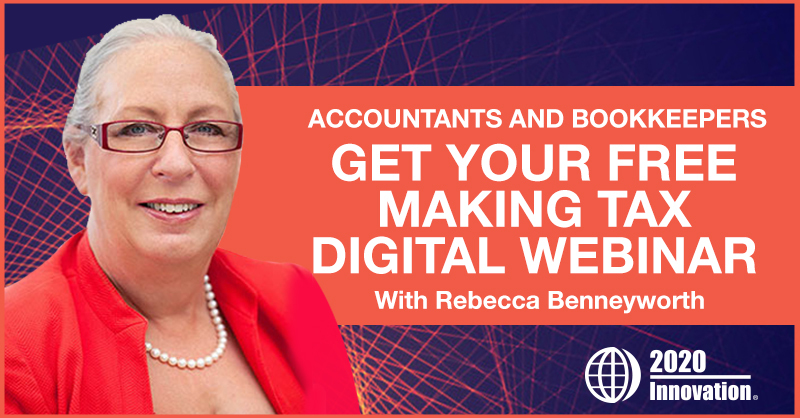 Accountants & Bookkeepers – download your complimentary MTD Update Webinar presented by Rebecca Benneyworth MBE BSc FCA. The webinar will clarify all of the rules for the new MTD regime for VAT which starts in April 2019. Rebecca explains which clients are mandated from April, and what you need to do to ensure that they are compliant. What CPD webinars are available? CPD Webinars for unlimited delegates, feature some of the best speakers on tax and accounting. Containing 14 x 2 hour webinars, including accounts updates,VAT updates and pre-year end tax planning. A series of update webinars designed to update delegates on the latest FCA regime on current and ongoing FCA developments. The auditing profession continues to grow as many firms support their clients in an ever developing business environment, ranging from IT developments to new regulations, accounting and auditing standards. 2020 members gain complimentary access to a full day of Tax, Accounts ans Audit regional seminars. Real life and forward thinking solutions to real problems. Excellent value. Prior to attending this seminar I was so confused and frightened about what to do with Making Tax Digital. Now I feel relaxed as I know how to migrate into MTD. Thanks 2020! "The conference provided very practical usable tools that can be transferred into practice." In just a few months we have doubled our take up rates by embracing the ideas and support from 2020 Tax Protection. This has resulted in us earning an additional £8,000 in profit from the scheme.